Fan: Double high power silent turbo fans, take away the heat by circulation of the heat in the machine through in and out vent. We offer 1 year warranty, please feel free to contact us for return or replacement if it is does not function properly. 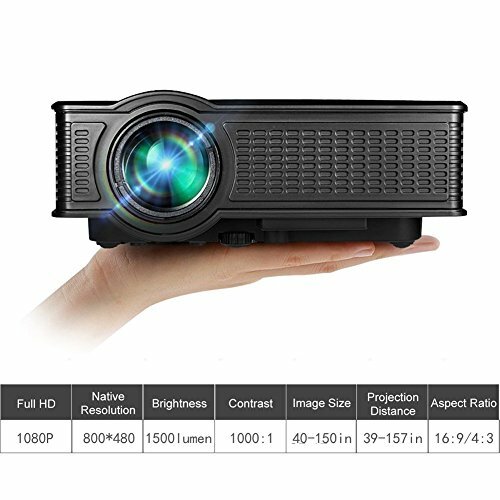 This projector is suitable for high definition home theater, private theater, big screen private theater, KTV video entertainment, nightclubs, party entertainment etc. Its 1500 Lumens brightness and 800*480 native resolution provide exceptional display quality. It can switch aspect ratio between 16:9 with 4:3 easily. High quality audio speaker, surround sound home theater effect, enjoy the shock of music. There are five kinds of inputs (HDMI/VGA/USB/AV/SD) for getting your favourite programs with a big screen. Making you enjoy videos entertainment by connecting the iPhone/iPad/Android device/Macbook/XBOX/PC/Laptop/DVD Player. Small size and weight, easy to take and travel. System support: Multi-media (music, picture, video, TXT). Enjoying watching movie and video game at home and outside for camping. High Quality Packed with 1 Year Warranty: 100% Brand New and High quality from VPRAWLS Store! We offer 12 months Warranty and 31 days free exchange for all the products which are built with the highest quality standards and we stand behind for best after service. If you have any questions about this product by GOXMGO, contact us by completing and submitting the form below. If you are looking for a specif part number, please include it with your message.